The wedding day has its very own special importance in everyone's lives. For this sole reason, everyone tries to find the most amazing thing for their special day. From wedding venues to wedding dress and trendy wedding invitations, everything has to be beyond perfection. If all this is true for you, you might prefer a trendy range of our new arrivals wedding cards. This collection of pretty and trendy wedding invitations is simply breathtaking and it is a never seen before collection. You will be amazed at our craftsmanship and artistic skill as each and every wedding invitation carries unique invitations ideas in them. 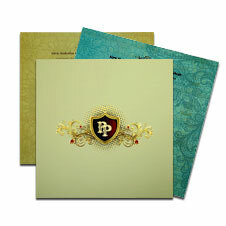 In our new arrivals section, you will find the trendiest and best online wedding invitation cards for sure. 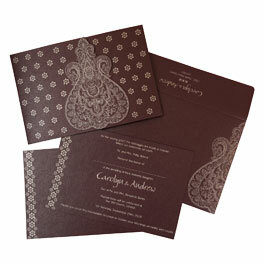 And, you can always peep in our other sections to find the other matching stationery for your 'big day'. Everything at 123WeddingCards is exquisitely crafted to make sure that you fall in love with it. The bright colors, classy quality and reasonable prices are just a few factors that will leave you awestruck. The best part of our collection is that you are allowed to customize your own wedding card and choose your own wedding invitation wordings. If you still have any concerns, suggestions or questions, you can get in touch with our dedicated customer support team who would be happy to help you in every wedding invitations related query.